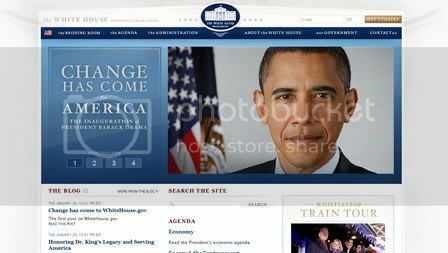 Whitehouse.gov features a blog, RSS feeds and an email newsletter. Communication. The new administration wants plans to provide “timely and in-depth content meant to keep everyone up-to-date and educated” using Whitehouse.gov. Participation. Noting that the new President was a community organizer, Phillips states that President Obama will encourage citizens to participate in his administration using the internet. To start: non-emergency legislation will be posted to Whitehouse.gov, where citizens will have 5 days to comment on it and provide suggestions of their own. These, of course, are tenets of good social media strategy. To be sure, President Obama is the first “internet president“ and I think citizens, policy analysts, media pundits and technology enthusiasts have good reason to believe that his use of the internet will be substantive, not just stylish. The Obama administration has the ability to turn Whitehouse.gov into one of the most important, dynamic and interactive websites in the world and his use of technology during his campaign has led many to believe that he knows the internet is more than fluff; that he understands the beneficial role technology can play in the governing process. Like all website launches, however, execution is key to success. Will President Obama provide high-quality content to his stakeholders on a regular basis? Will he stay engaged? Will he listen to the feedback he’s provided? Will he act on it? President Obama has the opportunity to leverage the power of the internet at a pivotal point in his country’s history. Everything so far indicates that there’s a good chance he’ll seize it, providing in the process a great case study for us in the tech and media worlds. to be valuable additions to the field of journalism. Yet their rise has created some thorny ethical questions for reporters and news organizations. After nearly a decade of interactive marketers bemoaning the fact that the web didn’t get its due on game day, the tide has definitively turned for Super Bowl advertisers. An interactive component to those $3 million :30 spots is now solidly de rigeur, rather than a nice-to-have. “No one just runs a TV spot any more. Most people pair their spot with an integrated campaign that includes the Internet,” Prof. Timothy Calkins, a clinical professor of marketing at the Kellogg School of Management at Northwestern University, is quoted as saying on Google’s Retail Blog. Calkins condusts an annual Super Bowl ad effectiveness study.